So, I went to Superstore this morning to try out the new points system. I already had the PC points app on my Ipad so off I went. 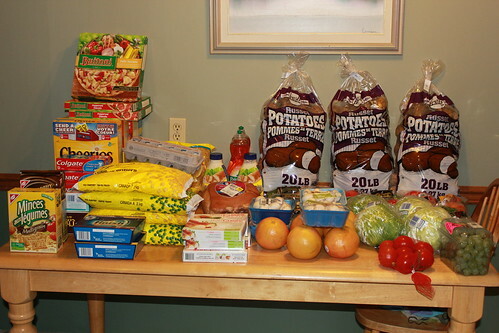 In case you are wondering what I do with all that produce I buy for a food buying group. The grand tally for everything was $177.87. I got at total of 65286 points! I had $2.50 in Checkout 51 cash back deals and one MIR for $6.69. 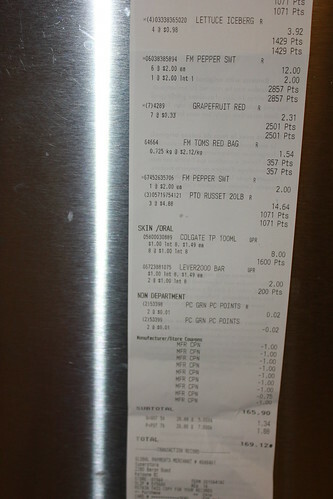 I used $8.75 in coupons.Which means all this actually cost $94.64! As you know if you spend $20 on produce you get 5000 points. I did that twice. 10000 points. I bought 4 Buitoni pizzas, I had 4 $1 coupons for them. They cost $20.92-$4=$16.92 and I got 20000 points for them which means I made $3.08 to buy them! The Hellman's mayonnaise was $3.99 each. I bought 2 and had $1.75 in coupons, plus I got 4000 points making them $1.11 each! The Finish was $5.97, I bought 2, I had a $1 off coupon and I am doing the MIR for the B1G1 free. So, $11.94 -$1-$6.69=$4.25 plus I got 10000 points so I made $5.75 to buy them! The Palmolive were $2.47 each or $4.94 for 2. I got 5000 points, so I got paid .06 to buy them! The Lever bars were $1 each, I bought 2 and had 2 $1 off coupons and there were 200 points on them so I made .20 to buy them. I screwed up on the Lean Cuisine as I thought I was get 2000 points per box, however it's the Lean Cuisine Fresh Inspirations not the Selections! The other Check out 51 I did was the Christie crackers and cookies. They were $1.77 and $1.97. Checkout 51 paid $1.50 and there were 500 points on the cookies making it $1.74 for both. 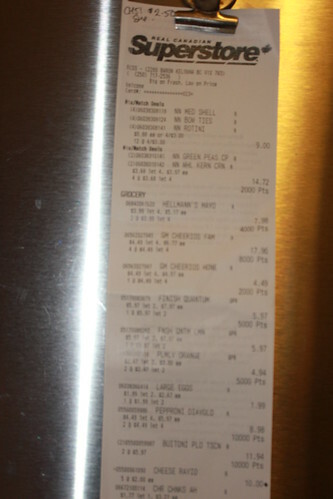 I think if you click on the picture you can make the receipt larger. You can see that they did not give me the 5000 points on the second Finish. I called them once I noticed it. 1-855-6PC-PLUS. They told me you can only buy one. I explained that it didn't say that anywhere and that the cashier explained the program as you can do point items as many times as you want, but only on one shop. In the end he said they would credit my account. I know others who got the points no problem. How about you? 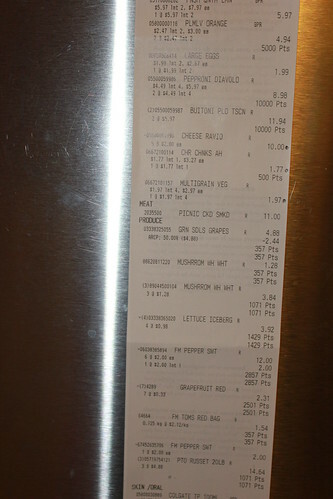 The frozen vegetables were $3.68 each and had 500 points each making them $3.18 a package. The Cheerios were $4.49 a box and had 2000 points each making them $2.29 a box. The Colgate toothpaste was $1 per box and had 100 points on each, making it .90 each. 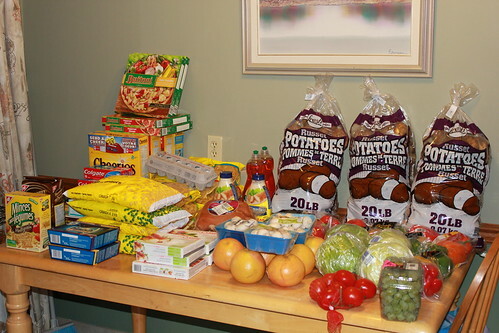 The non points things I bought were the pasta .75 a bag, and the large eggs $1.99. It says my account will be credited in 24 hours. Did you shop? Holy Cow!! We just got PC Plus in Atlantic Canada as well and I was just happy with spending $20.90 on produce and getting 5750 points. You killed it! I am going to have to look more closely at the matchups. I am wondering if the screaming deals will continue or quit once people are all signed up?